With ingredients this good it is best to keep things simple so a little Lemon Chili and Garlic make these Grilled Shrimp sing! Both myself and my wife were in great need of cheering up last weekend and as far as I am concerned that means great food. So we went and splurged on one of my favourite, if expensive treats and broke out the grill for some grilled shrimp. Depending where you live I am sure Shrimp varies greatly in price, although lets just say there was a thought of ‘really’ when I paid for these 8-10 count shrimp it the local market. But hey, sometimes you gotta treat yourself, right? Now with ingredients this good these is not a lot you need to do, in fact the less you do the better the meal is. 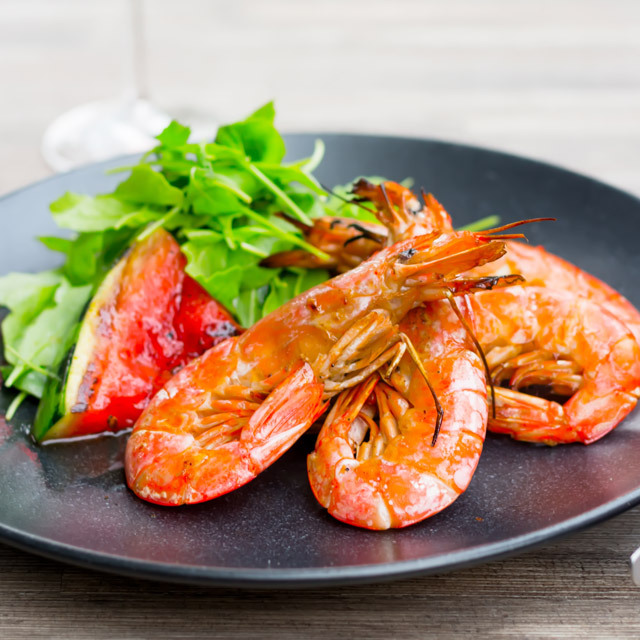 Just like my grilled trout dish, this grilled shrimp dish relies on a few great ingredients that add little hints to the wonderful sweet and smokey flavour of the shrimp. ‘But water melon’ I hear you say, and I respond with a resounding YES. The sweet tartness of the water melon works amazingly with the texture and flavour of the shrimp I think and if you have never grilled water melon then you really must try. You can go sweet with brown sugar or honey and serve it with ice cream, or go savoury with chili, salt and pepper and serve with seafood or pork. I can’t believe I was absent from the world of al fresco cooking for so long, I am loving it… Sat in my garden with my wife, our dogs and cats a bottle or two of wine, some simple great ingredients and some sunshine is so therapeutic. When your grill is ready to rock and roll, mix together the sweet chili sauce, oil for the water melon salt and pepper and use this to coat the water melon slices. Now onto the shrimp, mix together the garlic, chili, salt & pepper and oil and coat the shrimp. Now we are ready to cook, you will need to work on your own judgement on a little, the water melon takes 10 minutes to be just about perfect. I knew these shrimp would take about 7 based on experience but shrimp cooking time will entirely depend on their size, mine were 50g each, so around 8-10 count). Add the water melon to the grill, followed by the shrimp, half way through cooking flip over. Just before serving and whilst still on the grill squeeze the juice of one lemon over the shrimp and serve with the melon and some nice peppery rocket. 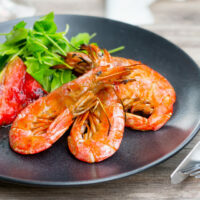 If using frozen shrimp defrost as quickly as you can, stick in a colander and allow cold water to run over them, they should defrost in about 15 minutes, this helps maintain the texture of the meat I find. It’s been really hot here in the Netherlands the last few weeks and when ever that happens we fire up the bbq. I made your grilled shrimp with watermelon and rocket yesterday and it was fabulous. This one is a keeper. Thank you for the recipe! This is such a pretty dish for the summer. Pairing the watermelon with the shrimp is brilliant. I am so intrigued how you added the sweet chili sauce to the watermelon for grilling. I can’t wait to see what that will taste like. Oh, we love grilling here! All summer long, we grill! Easy clean up and great flavor! You can’t go wrong! These shrimp look amazing! In the states we have a hard time finding the shrimp with the head on. Ours now are what they call easy peel, they are deheaded, split and veins removed! I love the presentation with the heads! This recipe sounds great with the grilled watermelon! I must give it a try! Love the photos! Sounds like a great Summer recipe. Grilled watermelon sounds unbelievable! I have never even thought of grilling watermelon before but you have inspired me 🙂 I will be adding some watermelon to our next BBQ menu for sure! I used to only eat fried popcorn shrimp and wouldn’t eat it any other way but I’m falling in love with it cooked all different ways. I haven’t tried it on the grill yet, though so I’m adding this one to the list! I see you got your hands on some seafood. Those prawns look great! Where are they from? Ooooh I need to try grilled watermelon! Perfect for summer. Good to see you posing some seafood, you know I love my shrimp. This looks awesome! I love grilling watermelon, yup finally got my hands on some great seafood… Soooo expensive but we are worth it, right? I am so, so jealous of your gorgeous grill set up! Tell me again how I quit my job and move to the Hungarian countryside…? 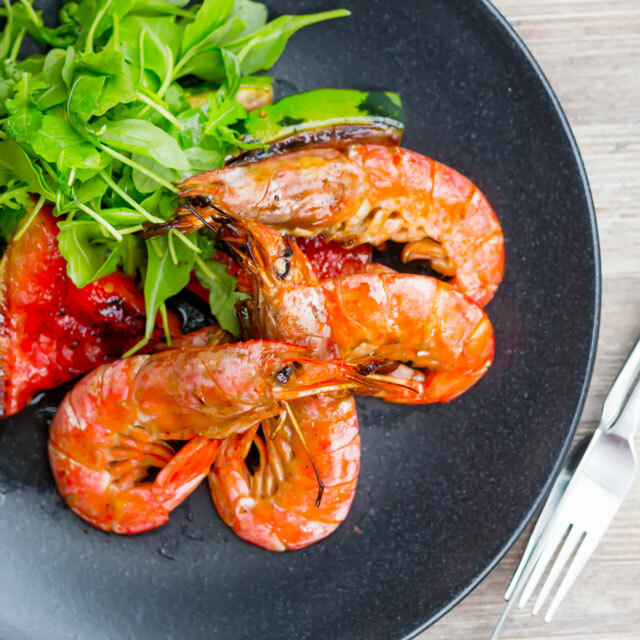 I love Grilled Shrimp Brian – it’s one of my very favorite ways to enjoy it! And pairing it with watermelon sounds delish! Totally with you on the alfresco cooking thing, I spent years not cooking outside after being forced to spend 9 months cooking outside… Feels great to be back at it again. Superb recipes, I love watermelon as a side, fantastic flavour profiles and colours in this recipe! 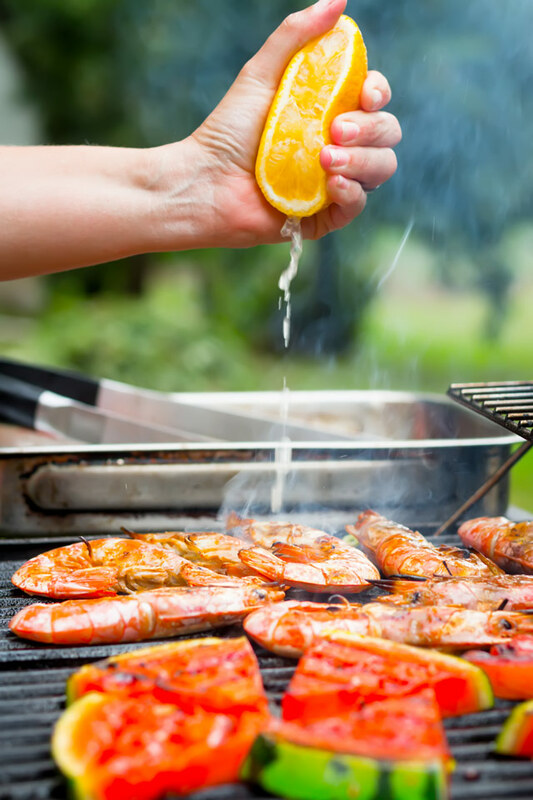 I may be salivating right now:-) Love shrimps (or prawns as we call them in the UK, to us shrimps are those tiny wee things), just wishing we had the weather for a BBQ right now as summer seems to have bypassed us so far! As a child and teenager, l used to stick to dishes l knew, was never adventurous enough to try new things, and shrimps were not on my list. l absolutely love them now, and l can’t believe l was so silly not to eat shrimps. This dish is my kind of perfect food when looking for a great treat, quick, delicious and posh. I know what you mean about paying more for quality food, the taste is so worth that extra money. I’ve never tried grilled water melon, but l can’t get enough of melons when they are in season, so l’ll have to give the grilled one a go.